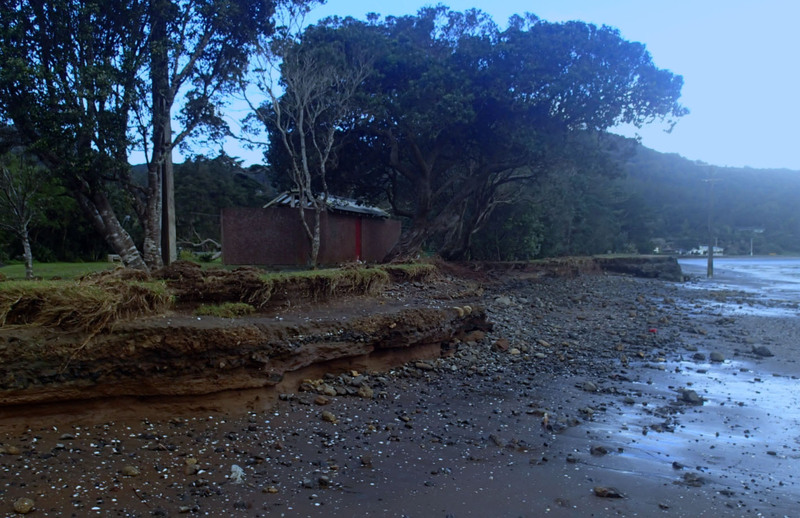 There has been some controversy recently concerning the Huia Sea Wall with suggestions that the Local Board is going to have it removed without telling anyone and that the Huia Domain will be lost. Can I assure everyone that this is not the case. The basic difficulty is that the sea wall is being undermined by mother nature. The erosion has occurred over a number of years although recently the rate of change has accelerated. With climate change, increased tidal surges and raised sea levels no doubt the acceleration in change is going to continue. Recent tides have been amongst the highest in the past 14 years and the area has experienced four one in a hundred year storm events in the past 12 months. Stage a “managed retreat” so that the sea wall is removed. Option one will keep things the way they are. Option two will mean that some of the domain is lost. It will also mean that the sea edge can be returned to a more natural form. It appears that a seawall like the existing one will not be possible and a “riprap” wall may have to be installed. This will make access to the beach difficult and there will be very little in the way of sandy beach at high tide. Despite suggestions to the contrary no decision has been made. The Board at its November 2014 meeting approved a consultation plan. There has been a meeting with locals, letter drops, and material left at the Huia Store. There is also this website which contains background material, a description of the options and the ability for locals to record their views. The consultation ends on January 23. If you want to have your say then you are able to do so through the website or you can contact any Local Board member or Parks West. Yes, there’s a tendency for some people to assume the worst about anybody who is elected, regardless. I blame talkback radio, and certain politicians at the National and local levels, should be seen as exceptions to the rule, rather than as typical. Keep up the good work, Sandra and team.